The poet - whose real name is George Mpanga - is known for singles like Follow the Leader, which he made with Maverick Sabre. He tells BBC News: "Platforms like YouTube help artists by giving everyone a fair shot at getting their voice out there." George the Poet's comments come on World Poetry Day, held each 21 March. The United Nations Educational, Scientific and Cultural Organization - UNESCO - decided in 1999 to introduce a World Poetry Day. It aims to promote the reading, writing, publishing and teaching of poetry. 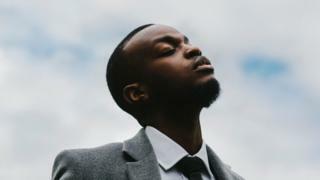 George the Poet, who opened the BBC's coverage of the wedding of Prince Harry and Meghan Markle and has his own podcast, believes social media has helped artists share their thoughts on a scale never seen before. He tells the BBC: "My career was propelled by putting my work on YouTube, and millions more can make use of the same opportunity. "Poetry is more relevant than ever. We live in times of change - right now more than ever - and poetry provides a way of tracking these changes in the journal of humanity." Alam now also performs her spoken word poetry live, but says she never intended to make a name for herself as a poet: "I was never interested in written poetry, and I always struggled to connect with it. "However, I was going through a tough time when my friend introduced me to spoken word poetry and I completely fell in love with it. I loved the performance element of it. It felt real. "The words were sharp, powerful and impactful. That night I decided to write my thoughts out. I wrote my first ever poem called 'I Hate Myself'". Alam believes social media has helped introduce newcomers to poetry as "social media makes it easier to access poetry and opens you up to a plethora of work from people of all backgrounds." She's most proud of her poem What Next?, about the uncertainty she felt after leaving university, because "it perfectly captures everything I was feeling at that point in time". Although social media platforms have allowed a lot of people to create and consume poetry, Andy Brown, poet and Professor of Creative Writing & English at Exeter University says it hasn't affected changed the way much professional poetry is distributed. Brown tells BBC News: "It has changed the game for some poets: the Instagram Poets, for example, whose short, aphoristic pieces reach large audiences. "It has also changed the way poets interact and network with each other, broadly 'democratising' the dissemination of poetry. "On the other hand, it has had virtually no impact at all on mainstream publishing house poets whose careers still run through the traditional publishing media and festival and event readings."